Everyone loves to pin their financial troubles on a tanking economy or an unstable market. But let’s face it; We have no one to blame but ourselves for the decisions we make about money. And we often have no idea why our noble intentions fall flat when we make financial choices. Richards is a financial planner who has watched his clients make the same inane mistakes with their money again and again. He saw the way they’d let circumstance and emotion dictate financial decisions and obliterate all sensibility. 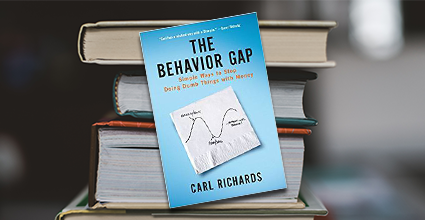 Richards termed this discrepancy between people’s good intentions and what they actually do, “the behavior gap.” He discovered that, once people understood this gap and what drives it, they are empowered to make the right choices and follow through on their goals. In The Behavior Gap, you’ll find the tools you need to rein in the emotional monster within and train it to abide by the financial rules you’ve always wanted to follow. Richards has an engaging writing style that will keep you captivated until the last word. Some critics complain the book does not dig as deeply into behavioral economics as it seems to promise and that it is only a beginner-level personal finance book. Most readers, though, have nothing but praise for The Behavior Gap and its enlightening message.